Posted by Shane Ryans on March 12, 2013. 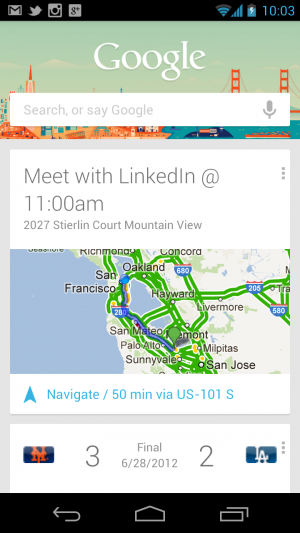 Google Now, a predictive personal assistant, has finally started working its way into its browser and Chrome OS. Although Google began working on the integration of its anticipatory alert system, currently only available on Android, in December, the search giant is just now fleshing out the build out. “Sadly, we still can’t play with it yet because the Google Now server URL still remains secret,” commented Francois Beaufort, developer and avid Google follower. Beaufort first spotted hints about this development in the coding for Chromium, the open source web browser project that shares much of the same code and features as Google Chrome. 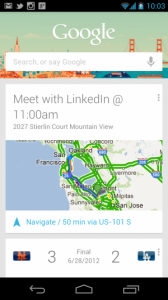 Google Now works by using “cards” that provide relevant information to you, like today’s weather, how much traffic to expect before you leave for work, alternate routes, boarding passes, restaurant reservations, updates on your favorite sports teams and more. With the swipe of your finger, cards automatically appear when they’re needed the most, and you have the ability to choose which cards you want to see.